Figures 1 and 2: Under condition of strong bending the visual perception of the knee is mainly due to the condyles of the knee. 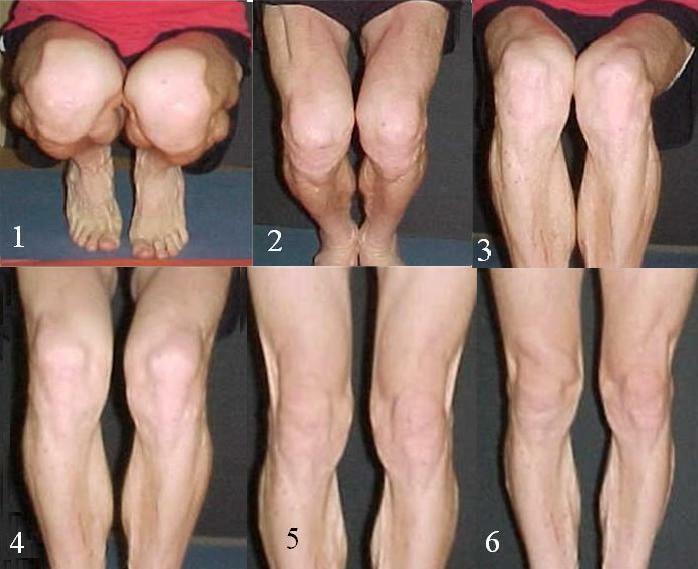 Figures 3 and 4: Under condition of medium bending the visual presentation is dominated by the patella. The part beside the patella is formed by the condyles of the femur. Figures 5 and 6: In up-right position the visual presentation is mainly due to the display of vastus medialis and lateralis. Under condition as presented in fig. 6 the patella can be moved freely. Contraction of the rectus femoris moves it up (2-3 cm), relaxation of the rectus femoris allows it to slide down again.